This adorable Clothes Pin Alligator is made with a simple clothes pin, paint, a pipe cleaner and googly eyes (if you have them). An easy and inexpensive kids craft to make! 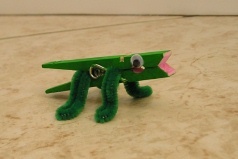 Make your aligator "chomp, chomp" by opening and closing the clothes pin! 1. Paint your clothes pin green (or whatever color you'd like your alligator to be) Cut your pipe cleaner in half. Fold the ends of your pipe cleaner into the center and press together. Repeat for the other half of the pipe cleaner. 2. Insert the alligator's front legs all the way into the clothes pin. Insert the back legs into the back of the clothes pin (as shown in the picture), you will probably need to glue the back legs to the clothes pin so they won't fall out. Glue on your google eyes on either side of the aligaotors face, or draw them on with a black marker and you're all done, great job!